I always arrive here at the end of the day. Good time to sum up everything but I want to lounge and vegetate. I want to curl up with my glass of wine. Supper is still in the making so I’ll wait. Maybe a cuppa decaf can coax the words from me. The bottom of my day/jar literally fell out in the morning. There I was, standing in the kitchen, holding a jar of soup while the bottom clang to the floor. Good thing the soup was still frozen. Otherwise, what a mess! It wasn’t indicative of how everything went. I had a pretty good day after the bottom fell out. I am still on track reading Breaking the Habit of Being Yourself. I’m applying what I’ve learned. I’m trying to stop waking up to the same day over and over like Bill Murray in Groundhog Day. That would be a daymare. My yesterday was not so good. I felt tired and down. I didn’t want the same so I visualize myself as I want to be – energetic and up. 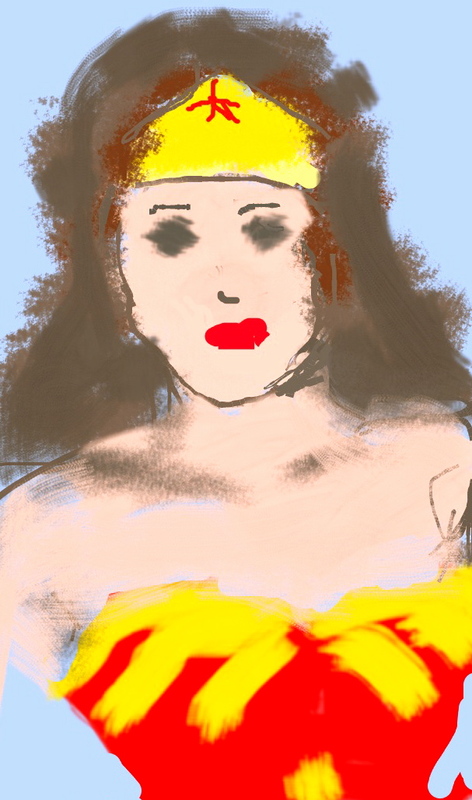 I went into the phone booth of my mind and put on my Wonder Woman costume. And voilà! I packed my gym bag with my swim paraphernalia so I was ready to go at the appointed time. No excuse to skip since I couldn’t find this or that. Next I headed downstairs and transplanted the rest of the tomato seedlings. It was not an earth shattering exciting day. All the same it was very satisfying to me, not having the fatigue. I will remember to be kinder to myself when I am tired. The natural progression from that is feeling down. There’s no need to punish myself more for feeling that way. The day is done. I’ve had my swim and feeling the more relaxed and mellow for it. It pays to make an effort to go. The dog is walked, supper ate and wine consumed. The dishwasher is slushing away. All my little art projects done for the day – the red cardinal for 365 somethings 2018 and my painted cloth block . They’re on the sidebar under my Instagram if you care to look. Time to shut it down till tomorrow. This entry was posted in Uncategorized and tagged life, making an effort, summing up the day, visualizing, when the bottom falls out, Wonder Woman, writing. Bookmark the permalink.